Coffee is the leading crop in the Wonago district of southern Ethiopia. Farmers living in the area usually lead good lives. In normal harvest seasons with good commodity prices, they produce enough to feed their large families. A local government worker says it's been two decades since they received emergency food aid. But this year, farmers who were once carrying sacks of coffee beans into the market are bringing their starving children to emergency feeding centers. Abraham Astatke of the zonal rural development bureau says farmers in Wonago are usually self-sufficient. 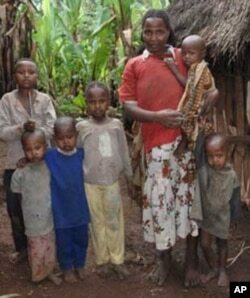 They have some of the largest families in Ethiopia, and now they are struggling to provide for them. "This district is densely populated. As many as 140 people live in an area of one square kilometer," Abraham says. "The combination of large family size, drought and the falling price of coffee has made the situation worse. " No matter what a family's economic situation, experts recommend spacing out pregnancies over time. “There is now definite evidence from large scale surveys in many countries that pregnancies too early in adolescence and too closely spaced - that means if a mother has more than five children - they carry a much higher risk for the mother and the child,” says Dr Abdulhamid Yishaq, a gynecologist working for the Center for Disease Control in Addis Ababa. Part of the reason, health officials say, is that women’s bodies are not given enough to time to restore nutrients needed to form a healthy fetus, and breast milk for the infant. The World Health Organization recommends that a couple wait two years between pregnancies. Statistics from the WHO reveal that intervals of 18 months or shorter increases the risk of neonatal and infant mortality, low birthweight and preterm births. Intervals of six months or earlier increase the risk of maternal mortality. When food shortages are a factor, the benefits of spacing out births are even greater. Health officials say food pressures would likely be less severe for smaller families, and for couples that allow more time between pregnancies. Having fewer children also helps alleviate some of the expenses related to purchasing, or growing, more food. And, they say smaller families could increase living standards, by making it less expensive to educate all of the children. The lack of food often affects children and pregnant women most severely. Malnutrition increases the risk of anemia, maternal mortality, and underweight or unhealthy newborns. At this clinic in Jemjemo village in southern Ethiopia, Amarech Tadele has come for help. When the harvest was good Amarech and her husband produced enough to feed the family. But this year, both the market and rain failed, leaving the family of 10 in dire situation. "The coffee plants flowered on two cropping seasons, but due to lack of rain, the flowers failed to give fruits," Amarech says. "Some nights we eat some food; others we just go to sleep on an empty stomach. It is not easy to be in a house where eight kids are asking for food." To make things worse, a disease has hit their food of last resort – enset, also called the false banana. As a result, she has come to the clinic with four children who are severely malnourished. Two belong to her brother, whose wife has died. Amerech is receiving a highly nutritious product called Plumpy'nut for the children. Health extension worker Tigist Flasa uses a plastic arm band to measure the circumference of the child's arm to determine the level of malnutrition. "This child is malnourished. Her face has swollen, which is the first stage of severe malnutrition. If there is a swelling on the arms, legs and face, they have to be immediately admitted to a hospital," Tigist says. Today, only two of the children show severe signs of malnutrition. The others are suffering from lack of a balanced diet. The clinic worker says they will recover after a couple of weeks of eating the high-protein Plumpy'nut. Back at the house, Amarech braids hair to make extra cash. Village women come here to get their hair braided and to talk to each other about their problems. One of the customers is 31-year-old Aberu Shibru. She is three months pregnant. Aberu is having trouble feeding her children because she's been abandoned by her husband. Aberu tells her peers about how he left her for a younger wife. She says her husband stopped working on her farm when he married a second wife. As a result her three children are starving. "I cannot feed them," Aberu says. "He has other children from the new wife that he takes care of. He has built a nice house for the younger wife and left me in an old hut. I feel abandoned. He comes to my hut when he pleases." And that is how she got pregnant again. At the time she was not taking birth control pills because he had not visited in months. She says the last time she saw him was the night she got pregnant. Will family planning take hold? Wonago district has an average of five families living in a household. Jemjemo village has the highest, with as much as eight families per household. Family planning campaigns run by the government have not made a difference. Health worker Tigist says there are encouraging signs in family planning habits but it takes a long time to bring about meaningful change. "We give them family planning lessons. We also give them options to control their family size. Some women are on birth control pills others take a three month injection we call Depo [depo-provera]. But we still have a long way to go overcoming logistical and cultural barriers to enhance access to birth control," Tigist says. The organization Planned Parenthood says only 13% of Ethiopian women, including 4% in rural areas, use contraception. Some groups, like Population Action International, attribute the problem in part to emphasis on abstinence-only education and restrictions on the distribution of condoms to prostitutes. The lack of infrastructure is another problem. Activists complain of a shortage of health care workers and of easily reachable clinics. It’s not uncommon, say activists, for women to walk miles to a doctor, who may be responsible for tens of thousands of patients. Health care specialists also say traditional attitudes make it harder for women to use contraception. “Some husbands say if a woman takes contraception, she can enjoy herself (with other men) rather than her husband,” according to Hailu Bernahu, medical director of the Lalibela hospital. Some men complain that smaller families mean less free labor available for farming. Wonago's families continue to suffer. The rainy season started late and ended early. Drought that has affected millions in East Africa is magnified by the large family size in this district. Back in the village, Amarech Tadele is singing for God's mercy as she prepares lunch for her children. She is making bread from fibers of false banana roots that in good times they would have thrown out.